The Lee Development Group told the Gazette they'll open the Fillmore, a new music club at Colesville and Georgia, by next September, knock on wood. (Tap tap.) That's only if they can get plans for the project approved by the Planning Board this summer and break ground this October. Eventually, the Fillmore will be the anchor of a larger hotel-and-office complex that'll go up on the parking lots behind Colesville Road. The J.C. Penney building, soon to become the Fillmore, as it looked in 2007. 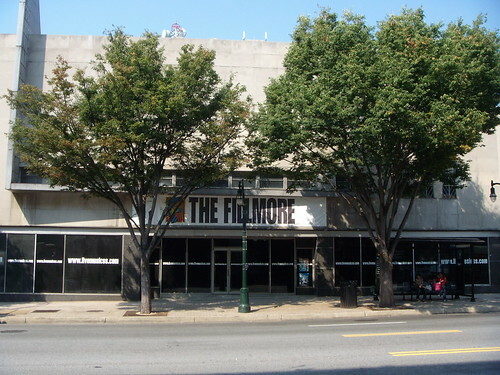 As you probably know, the Fillmore will occupy a former J.C. Penney department store that closed in the 1980's. A new (albeit very small) graphic from the Gazette shows how Lee Development Group plans to incorporate the historic façade into the new venue - including turning the three vertical grilles on the right side of the building into "equalizer bars," as I suggested way back in 2007.
International concert promoter Live Nation was given rights to operate the 2000-seat venue in 2007, stoking the ire of local promoter Seth Hurwitz, who runs the 9:30 Club in D.C. and briefly bid to run the Fillmore himself. We know that Hurwitz' I.M.P. Productions has thought about opening a club in Downtown Silver Spring since 2000, going so far as to look at various (and at the time abandoned) buildings in the central business district. Might they be interested in a former warehouse-turned-coffeehouse that seems unusually well-suited to be a concert hall? After all, no one says you can only have ONE club in a given place. The Fillmore couldn't happen soon enough. Considering our economic climate, I think it's imperative. Maybe this speeded up permitting process could be made a model for other projects as government's way of cutting costs for doing business in Silver Spring and Montgomery County in general. Nice idea for the Mayorga space. I think that's a winner and would make a nice counter balance to the big names at the Fillmore. I'm excited about the Fillmore and I'm happy they are keeping the old JC Penney facade. And I agree, that is a nice idea for the former Mayorga. I just wish the parking was easier in that area. That garage, although close, is pretty inconvenient to get in and out of.